😁😴🏫🗽 Dj tour Angkor (ខ្មែរ ៖ អង្គរ or នគរ, "Capital City") is a region of Cambodia that served as the seat of the Khmer Empire, which flourished from approximately the 9th to 15th centuries. The word Angkor is derived from the Sanskrit nagara (नगर), meaning "city". The Angkorian period began in AD 802, when the Khmer Hindu monarch Jayavarman II declared himself a "universal monarch" and "god-king", and lasted until the late 14th century, first falling under Ayutthayan suzerainty in 1351. 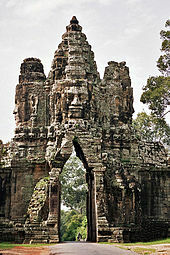 A Khmer rebellion resulted in the 1431 sacking of Angkor by Ayutthaya, causing its population to migrate south to Longvek. The ruins of Angkor are located amid forests and farmland to the north of the Great Lake (Tonlé Sap) and south of the Kulen Hills, near modern-day Siem Reap city (13°24′N, 103°51′E), in Siem Reap Province. The temples of the Angkor area number over one thousand, ranging in scale from nondescript piles of brick rubble scattered through rice fields to the magnificent Angkor Wat, said to be the world's largest single religious monument. Many of the temples at Angkor have been restored, and together, they comprise the most significant site of Khmer architecture. Visitor numbers approach two million annually, and the entire expanse, including Angkor Wat and Angkor Thom is collectively protected as a UNESCO World Heritage Site. This popularity of the site among tourists presents multiple challenges to the preservation of the ruins. In 2007, an international team of researchers using satellite photographs and other modern techniques concluded that Angkor had been the largest preindustrial city in the world, with an elaborate infrastructure system connecting an urban sprawl of at least ១០០០ សហតិមាត្រការ៉េ (៣៩០ ម៉ាយ ក.) to the well-known temples at its core. The closest rival to Angkor, the Mayan city of Tikal in Guatemala, was between ១០០ and ១៥០ សហតិមាត្រការ៉េs (៣៩ and ៥៨ ម៉ាយ ក,) in total size. Although its population remains a topic of research and debate, newly identified agricultural systems in the Angkor area may have supported up to one million people. The Angkorian period may be said to have begun shortly after 800 AD, when the Khmer King Jayavarman II announced the independence of Kambujadesa (Cambodia) from Java and established his capital of Hariharalaya (now known as Roluos) at the northern end of Tonlé Sap. Through a program of military campaigns, alliances, marriages and land grants, he achieved a unification of the country bordered by China to the north, Champa (now Central Vietnam) to the east, the ocean to the south and a place identified by a stone inscription as "the land of cardamoms and mangoes" to the west. In 802, Jayavarman articulated his new status by declaring himself "universal monarch" (chakravartin) and, in a move that was to be imitated by his successors and that linked him to the cult of Siva, taking on the epithet of "god-king" (devaraja). Before Jayavarman, Cambodia had consisted of a number of politically independent principalities collectively known to the Chinese by the names Funan and Chenla. In 889, Yasovarman ascended to the throne. A great king and an accomplished builder, he was celebrated by one inscription as "a lion-man; he tore the enemy with the claws of his grandeur; his teeth were his policies; his eyes were the Veda." Near the old capital of Hariharalaya, Yasovarman constructed a new city, called Yasodharapura. In the tradition of his predecessors, he also constructed a massive reservoir called baray. The significance of such reservoirs has been debated by modern scholars, some of whom have seen in them a means of irrigating rice fields, and others of whom have regarded them as religiously charged symbols of the great mythological oceans surrounding Mount Meru, the abode of the gods. The mountain, in turn, was represented by an elevated temple, in which the "god-king" was represented by a lingam. In accordance with this cosmic symbolism, Yasovarman built his central temple on a low hill known as Phnom Bakheng, surrounding it with a moat fed from the baray. He also built numerous other Hindu temples and ashrams, or retreats for ascetics. Over the next 300 years, between 900 and 1200, the Khmer Empire produced some of the world's most magnificent architectural masterpieces in the area known as Angkor. Most are concentrated in an area approximately ១៥ ម៉ាយល៍ (២៤ គ.ម.) east to west and ៥ ម៉ាយល៍ (៨�០ គ.ម.) north to south, although the Angkor Archaeological Park, which administers the area, includes sites as far away as Kbal Spean, about ៣០ ម៉ាយល៍ (៤៨ គ.ម.) to the north. Some 72 major temples or other buildings are found within this area, and the remains of several hundred additional minor temple sites are scattered throughout the landscape beyond. Because of the dispersed, low-density nature of the medieval Khmer settlement pattern, Angkor lacks a formal boundary, and its extent is therefore difficult to determine. However, a specific area of at least ១០០០ គ.ម២ (៣៩០ ម៉ាយ ក.) beyond the major temples is defined by a complex system of infrastructure, including roads and canals that indicate a high degree of connectivity and functional integration with the urban core. In terms of spatial extent (although not in terms of population), this makes it the largest urban agglomeration in human history prior to the Industrial Revolution, easily surpassing the nearest claim, that of the Mayan city of Tikal. The principal temple of the Angkorian region, Angkor Wat, was built between 1113 and 1150 by King Suryavarman II. Suryavarman ascended to the throne after prevailing in a battle with a rival prince. An inscription says that, in the course of combat, Suryavarman leapt onto his rival's war elephant and killed him, just as the mythical bird-man Garuda slays a serpent. After consolidating his political position through military campaigns, diplomacy, and a firm domestic administration, Suryavarman launched into the construction of Angkor Wat as his personal temple mausoleum. Breaking with the tradition of the Khmer kings, and influenced perhaps by the concurrent rise of Vaisnavism in India, he dedicated the temple to Vishnu rather than to Siva. With walls nearly half a mile long on each side, Angkor Wat grandly portrays the Hindu cosmology, with the central towers representing Mount Meru, home of the gods; the outer walls, the mountains enclosing the world; and the moat, the oceans beyond. The traditional theme of identifying the Cambodian devaraja with the gods, and his residence with that of the celestials, is very much in evidence. The measurements themselves of the temple and its parts in relation to one another have cosmological significance. Suryavarman had the walls of the temple decorated with bas reliefs depicting not only scenes from mythology, but also from the life of his own imperial court. In one of the scenes, the king himself is portrayed as larger in size than his subjects, sitting cross-legged on an elevated throne and holding court, while a bevy of attendants make him comfortable with the aid of parasols and fans. Following the death of Suryavarman around 1150 AD, the kingdom fell into a period of internal strife. 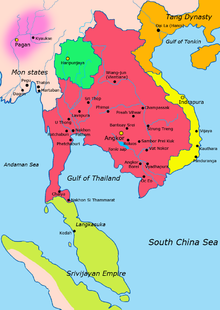 Its neighbors to the east, the Cham of what is now southern Vietnam, took advantage of the situation in 1177 to launch a seaborne invasion up the Mekong River and across Tonlé Sap. The Cham forces were successful in sacking the Khmer capital of Yasodharapura and in killing the reigning king. However, a Khmer prince who was to become King Jayavarman VII rallied his people and defeated the Cham in battles on the lake and on the land. In 1181, Jayavarman assumed the throne. He was to be the greatest of the Angkorian kings. Over the ruins of Yasodharapura, Jayavarman constructed the walled city of Angkor Thom, as well as its geographic and spiritual center, the temple known as the Bayon. Bas-reliefs at the Bayon depict not only the king's battles with the Cham, but also scenes from the life of Khmer villagers and courtiers. Jayavarman oversaw the period of Angkor's most prolific construction, which included building of the well-known temples of Ta Prohm and Preah Khan, dedicating them to his parents. This massive program of construction coincided with a transition in the state religion from Hinduism to Mahayana Buddhism, since Jayavarman himself had adopted the latter as his personal faith. During Jayavarman's reign, Hindu temples were altered to display images of the Buddha, and Angkor Wat briefly became a Buddhist shrine. Following his death, a Hindu revival included a large-scale campaign of desecrating Buddhist images, until Theravada Buddhism became established as the land's dominant religion from the 14th century. The year 1296 marked the arrival at Angkor of the Chinese diplomat Zhou Daguan. Zhou's one-year sojourn in the Khmer capital during the reign of King Indravarman III is historically significant, because he penned a still-surviving account of approximately 40 pages detailing his observations of Khmer society. Some of the topics he addressed in the account were those of religion, justice, kingship, agriculture, slavery, birds, vegetables, bathing, clothing, tools, draft animals, and commerce. In one passage, he described a royal procession consisting of soldiers, numerous servant women and concubines, ministers and princes, and finally, "the sovereign, standing on an elephant, holding his sacred sword in his hand." Together with the inscriptions that have been found on Angkorian stelae, temples and other monuments, and with the bas-reliefs at the Bayon and Angkor Wat, Zhou's journal is the most important source of information about everyday life at Angkor. Filled with vivid anecdotes and sometimes incredulous observations of a civilization that struck Zhou as colorful and exotic, it is an entertaining travel memoir as well. It is widely believed that the abandonment of the Khmer capital occurred as a result of Ayutthaya invasions. Ongoing wars with the Siamese were already sapping the strength of Angkor at the time of Zhou Daguan toward the end of the 13th century. In his memoirs, Zhou reported that the country had been completely devastated by such a war, in which the entire population had been obligated to participate. After the collapse of Angkor in 1431, many persons, texts and institutions were taken to the Ayutthaya capital of Ayutthaya in the west, while others departed for the new center of Khmer society at Longvek further south, though the official capital later moved, first to Oudong around ៤៥ សហាតិមាត្រ (២៨ ម៉ៃ.) from Phnom Penh in Ponhea Leu District, and then to the present site of Phnom Penh. Some scholars have connected the decline of Angkor with the conversion of Cambodia to Theravada Buddhism following the reign of Jayavarman VII, arguing that this religious transition eroded the Hindu conception of kingship that undergirded the Angkorian civilization. According to Angkor scholar George Coedès, Theravada Buddhism's denial of the ultimate reality of the individual served to sap the vitality of the royal personality cult which had provided the inspiration for the grand monuments of Angkor. The vast expanse of temples required an equally large body of workers to maintain them; at Ta Prohm, a stone carving states that 12,640 people serviced that single temple complex. Not only could the spread of Buddhism have eroded this workforce, but it could have also impacted the estimated 300,000 agricultural workers required to feed them all. According to George Coedès, the weakening of Angkor's royal government by ongoing war and the erosion of the cult of the devaraja undermined the government's ability to engage in important public works, such as the construction and maintenance of the waterways essential for irrigation of the rice fields upon which Angkor's large population depended for its sustenance. As a result, Angkorian civilization suffered from a reduced economic base, and the population was forced to scatter. Other scholars attempting to account for the rapid decline and abandonment of Angkor have hypothesized natural disasters such as disease (Bubonic Plague), earthquakes, inundations, or drastic climate changes as the relevant agents of destruction. Recent research by Australian archaeologists suggests that the decline may have been due to a shortage of water caused by the transition from the Medieval Warm Period to the Little Ice Age. LDEO dendrochronological research has established tree-ring chronologies indicating severe periods of drought across mainland Southeast Asia in the early 15th century, raising the possibility that Angkor's canals and reservoirs ran dry and ended expansion of available farmland. Although there is evidence to the contrary (Leonowens, 1870), many scholars believe the great city and temples remained largely cloaked by the forest until the late 19th century, when French archaeologists began a long restoration process. From 1907 to 1970, work was under the direction of the École française d'Extrême-Orient, which cleared away the forest, repaired foundations, and installed drains to protect the buildings from water damage. In addition, scholars associated with the school and including George Coedès, Maurice Glaize, Paul Mus, Philippe Stern and others initiated a program of historical scholarship and interpretation that is fundamental to the current understanding of Angkor. Work resumed after the end of the Cambodian Civil War and, since 1993, has been jointly co-ordinated by the Indian, German, Japanese and UNESCO through the International Co-ordinating Committee on the Safeguarding and Development of the Historic Site of Angkor (ICC), while Cambodian work is carried out by the Authority for the Protection and Management of Angkor and the Region of Siem Reap (APSARA), created in 1995. Some temples have been carefully taken apart stone by stone and reassembled on concrete foundations, in accordance with the method of anastylosis. World Monuments Fund has aided Preah Khan, the Churning of the Sea of Milk (a 49-meter-long bas-relief frieze in Angkor Wat), Ta Som, and Phnom Bakheng. International tourism to Angkor has increased significantly in recent years, with visitor numbers reaching 900,000 in 2006; this poses additional conservation problems but has also provided financial assistance to the restoration effort. With the increased growth in tourism at Angkor, new hotels and restaurants are being built to accommodate such growth. Each new construction project drills underground to reach the water table, which has a limited storage capacity. This demand on the water table could undermine the stability of the sandy soils under the monuments at Angkor, leading to cracks, fissures and collapses. Making matters worse, the peak tourist season corresponds with Cambodia's dry season, which leads to excessive pumping of ground water when it is least replenished naturally. Looting has been an ever-growing threat to the Angkor archaeological landscape. According to APSARA, the official Cambodian agency charged with overseeing the management of Angkor, "vandalism has multiplied at a phenomenal rate, employing local populations to carry out the actual thefts, heavily armed intermediaries transport objects, often in tanks or armored personnel carriers, often for sale across the Cambodian border." ទំព័រគំរូ:Section OR The increasing number of tourists, around two million per year, exerts pressure on the archaeological sites at Angkor by walking and climbing on the (mostly) sandstone monuments at Angkor. This direct pressure created by unchecked tourism is expected to cause significant damage to the monuments in the future. In sites such as Angkor, tourism is inevitable. Therefore, the site management team cannot exclusively manage the site. The team has to manage the flow of people. Millions of people visit Angkor each year, making the management of this flow vital to the quickly decaying structures. Western tourism to Angkor began in 1970s. The sandstone monuments and Angkor are not made for this type of heightened tourism. Moving forward, UNESCO and local authorities at the site are in the process of creating a sustainable plan for the future of the site. Since 1992, UNESCO has moved towards conserving Angkor. Thousands of new archaeological sites have been discovered by UNESCO, and the organization has moved towards protected cultural zones. Two decades later, over 1000 people are employed full-time at the site for cultural sensitivity reasons. Part of this movement to limit the impacts of tourism has been to only open certain areas of the site. However, much of the 1992 precautionary measures and calls for future enforcement have fallen through. Globally, and locally, the policy-making has been successful. But the implementation has failed. This implementation has failed for a number of reasons. First, there are conflicts of interest in Cambodia. While the site is culturally important to them, Cambodia is a poor country. Its GDP is marginally larger than Afghanistan’s. Tourism is a vital part to the Cambodian economy, and shutting down parts of Angkor, the largest tourist destination in the country, is not an option. A second reason stems from the government’s inability to organize around the site. The Cambodian government has failed in organizing a robust team of cultural specialists and archaeologists to service the site. What may save the site in the future is not in Cambodia at all. In the Indian state of Bihar, government wants to build an exact replica of Angkor Wat. While religiously, financially, and nationally this is controversial, it is perhaps the only chance we have of saving Angkor Wat for the future. Historical Angkor was more than a site for religious art and architecture. It was the site of vast cities that served all the needs of the Khmer people. Aside from a few old bridges, however, all of the remaining monuments are religious edifices. In Angkorian times, all non-religious buildings, including the residence of the king himself, were constructed of perishable materials, such as wood, "because only the gods had a right to residences made of stone." Similarly, the vast majority of the surviving stone inscriptions are about the religious foundations of kings and other potentates. As a result, it is easier to write the history of Angkorian state religion than it is to write that of just about any other aspect of Angkorian society. Buddhism, in both its Mahayana and Theravada varieties. The religion of pre-Angkorian Cambodia, known to the Chinese as Funan (1st century AD to ca. 550) and Chenla (ca. 550 - ca. 800 AD), included elements of Hinduism, Buddhism and indigenous ancestor cults. Temples from the period of Chenla bear stone inscriptions, in both Sanskrit and Khmer, naming both Hindu and local ancestral deities, with Shiva supreme among the former. The cult of Harihara was prominent; Buddhism was not, because, as reported by the Chinese pilgrim Yi Jing, a "wicked king" had destroyed it. Characteristic of the religion of Chenla also was the cult of the lingam, or stone phallus that patronized and guaranteed fertility to the community in which it was located. The Khmer king Jayavarman II, whose assumption of power around 800 AD marks the beginning of the Angkorian period, established his capital at a place called Hariharalaya (today known as Roluos), at the northern end of the great lake, Tonlé Sap. 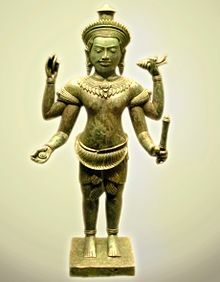 Harihara is the name of a deity that combines the essence of Vishnu (Hari) with that of Shiva (Hara) and that was much favored by the Khmer kings. Jayavarman II's adoption of the epithet "devaraja" (god-king) signified the monarch's special connection with Shiva. The beginning of the Angkorian period was also marked by changes in religious architecture. During the reign of Jayavarman II, the single-chambered sanctuaries typical of Chenla gave way to temples constructed as a series of raised platforms bearing multiple towers. Increasingly impressive temple pyramids came to represent Mount Meru, the home of the Hindu gods, with the moats surrounding the temples representing the mythological oceans. Typically, a lingam served as the central religious image of the Angkorian temple-mountain. The temple-mountain was the center of the city, and the lingam in the main sanctuary was the focus of the temple. The name of the central lingam was the name of the king himself, combined with the suffix -esvara, which designated Shiva. Through the worship of the lingam, the king was identified with Shiva, and Shaivism became the state religion. Thus, an inscription dated 881 AD indicates that king Indravarman I erected a lingam named Indresvara. Another inscription tells us that Indravarman erected eight lingams in his courts and that they were named for the "eight elements of Shiva". Similarly, Rajendravarman, whose reign began in 944 AD, constructed the temple of Pre Rup, the central tower of which housed the royal lingam called Rajendrabhadresvara. In the early days of Angkor, the worship of Vishnu was secondary to that of Shiva. The relationship seems to have changed with the construction of Angkor Wat by King Suryavarman II as his personal mausoleum at the beginning of the 12th century. The central religious image of Angkor Wat was an image of Vishnu, and an inscription identifies Suryavarman as "Paramavishnuloka," or "he who enters the heavenly world of Vishnu." Religious syncretism, however, remained thoroughgoing in Khmer society: the state religion of Shaivism was not necessarily abrogated by Suryavarman's turn to Vishnu, and the temple may well have housed a royal lingam. Furthermore, the turn to Vaishnavism did not abrogate the royal personality cult of Angkor. by which the reigning king was identified with the deity. According to Angkor scholar Georges Coedès, "Angkor Wat is, if you like, a vaishnavite sanctuary, but the Vishnu venerated there was not the ancient Hindu deity nor even one of the deity's traditional incarnations, but the king Suryavarman II posthumously identified with Vishnu, consubstantial with him, residing in a mausoleum decorated with the graceful figures of apsaras just like Vishnu in his celestial palace." Suryavarman proclaimed his identity with Vishnu, just as his predecessors had claimed consubstantiation with Shiva. In the last quarter of the 12th century, King Jayavarman VII departed radically from the tradition of his predecessors when he adopted Mahayana Buddhism as his personal faith. Jayavarman also made Buddhism the state religion of his kingdom when he constructed the Buddhist temple known as the Bayon at the heart of his new capital city of Angkor Thom. In the famous face towers of the Bayon, the king represented himself as the bodhisattva Avalokiteshvara moved by compassion for his subjects. Thus, Jayavarman was able to perpetuate the royal personality cult of Angkor, while identifying the divine component of the cult with the bodhisattva rather than with Shiva. The Hindu restoration began around 1243 AD, with the death of Jayavarman VII's successor, Indravarman II. The next king, Jayavarman VIII, was a Shaivite iconoclast who specialized in destroying Buddhist images and in reestablishing the Hindu shrines that his illustrious predecessor had converted to Buddhism. During the restoration, the Bayon was made a temple to Shiva, and its central 3.6 meter tall statue of the Buddha was cast to the bottom of a nearby well. Everywhere, cultist statues of the Buddha were replaced by lingams. When Chinese traveller Zhou Daguan came to Angkor in AD 1296, he found what he took to be three separate religious groups. The dominant religion was that of Theravada Buddhism. Zhou observed that the monks had shaven heads and wore yellow robes. The Buddhist temples impressed Zhou with their simplicity. He noted that the images of Buddha were made of gilded plaster. The other two groups identified by Zhou appear to have been those of the Brahmans and of the Shaivites. About the Brahmans, Zhou had little to say, except that they were often employed as high officials. Of the Shaivites, whom he called "Taoists", Zhou wrote, "the only image which they revere is a block of stone analogous to the stone found in shrines of the god of the soil in China." During the course of the 13th century, Theravada Buddhism transmitted through the Mon kingdoms of Dvaravati and Haripunchai made its appearance at Angkor. Gradually, it became the dominant religion of Cambodia, displacing both Mahayana Buddhism and Shaivism. The practice of Theravada Buddhism at Angkor continues until this day. The area of Angkor has many significant archaeological sites, including the following: Angkor Thom, Angkor Wat, Baksei Chamkrong, Banteay Kdei, Banteay Samré, Banteay Srei, Baphuon, the Bayon, Chau Say Tevoda, East Baray, East Mebon, Kbal Spean, the Khleangs, Krol Ko, Lolei, Neak Pean, Phimeanakas, Phnom Bakheng, Phnom Krom, Prasat Ak Yum, Prasat Kravan, Preah Khan, Preah Ko, Preah Palilay, Preah Pithu, Pre Rup, Spean Thma, Srah Srang, Ta Nei, Ta Prohm, Ta Som, Ta Keo, Terrace of the Elephants, Terrace of the Leper King, Thommanon, West Baray, West Mebon. Another city at Mahendraparvata was discovered in 2013. Angkor is a Khmer term meaning "city". It comes from the Sanskrit nagara. Banteay is a Khmer term meaning "citadel" or "fortress" that is also applied to walled temples. Esvara, or Isvara, is a suffix referring to the god Shiva. Gopura is a Sanskrit term meaning "entrance pavilion" or "gateway". Jaya is a prefix meaning "victory". Phnom is a Khmer term meaning "mountain". Prasat is a Khmer term meaning "temple". It comes from the Sanskrit prasada. ↑ Higham, The Civilization of Angkor, p.4. ↑ ៤,០ ៤,១ Evans et al., A comprehensive archaeological map of the world's largest preindustrial settlement complex at Angkor, Cambodia, Proceedings of the National Academy of Sciences of the USA, August 23, 2007. ↑ "Map reveals ancient urban sprawl," BBC News, 14 August 2007. ↑ Higham, The Civilization of Angkor, pp.53 ff. ; Chandler, A History of Cambodia, p.34 ff. ↑ Chandler, A History of Cambodia, p.26; Coedès, Pour mieux comprendre Angkor, p.4. ↑ Higham, The Civilization of Angkor, pp.63 ff. ↑ Chandler, A History of Cambodia, p.40. ↑ Coedès, Pour mieux comprendre Angkor, p.10. ↑ Higham, The Civilization of Angkor, p.60; Chandler, A History of Cambodia, p.38 f.
↑ Higham, The Civilization of Angkor, pp.112 ff. ; Chandler, A History of Cambodia, p.49. ↑ Chandler, A History of Cambodia, p.50 f.
↑ Higham, The Civilization of Angkor, pp.120 ff. ↑ Tom St John Gray, Angkor Wat: Temple of Boom, World Archeology, 7 November 2011. ↑ Higham, The Civilization of Angkor, p.116. ↑ Higham, The Civilization of Angkor, pp.134 ff. ; Chandler, A History of Cambodia, pp.71 ff. ↑ Coedès, Pour mieux comprendre Angkor, p.32. ↑ Chandler, A History of Cambodia, p.78 ff. ↑ Coedès, Pour mieux comprendre Angkor, pp.64-65. ↑ Richard Stone, Divining Angkor, National Geographic, July 2009. ↑ ២៣,០ ២៣,១ Coedès, Pour mieux comprendre Angkor, p.30. ↑ "Tourist invasion threatens to ruin glories of Angkor," The Observer. ↑ Coedès, Pour mieux comprendre Angkor, p.18. ↑ Coedès, Pour mieux comprendre Angkor, p.2. ↑ Chandler, A History of Cambodia, pp.19-20. ↑ Higham, The Civilization of Angkor, p.46. ↑ Coedès, The Indianized States of Southeast Asia, p.73f. ↑ ៣៧,០ ៣៧,១ Chandler, A History of Cambodia, p.20. ↑ ៣៨,០ ៣៨,១ Higham, The Civilization of Angkor, p.57. ↑ Chandler, A History of Cambodia, p.34. ↑ Higham, The Civilization of Angkor, p.9, 60. ↑ Stern, "Le temple-montagne khmèr," p.615. ↑ Stern, "Le temple-montagne khmèr," p.612. ↑ ៤៣,០ ៤៣,១ Stern, "Le temple-montagne khmèr," p.616. ↑ ៤៤,០ ៤៤,១ Higham, The Civilization of Angkor, p.63. ↑ Higham, The Civilization of Angkor, pp.73ff. ↑ Higham, The Civilization of Angkor, p.118. ↑ Coedès, Pour mieux comprendre Angkor, p.63. ↑ Higham, The Civilization of Angkor, p.121. ↑ Coedès, Pour mieux comprendre Angkor, p.62. ↑ Higham, The Civilization of Angkor, p.133. ↑ Higham, The Civilization of Angkor, p.137. ↑ ៥២,០ ៥២,១ ៥២,២ Chandler, A History of Cambodia, p.72. ↑ Coedès, Pour mieux comprendre Angkor, p.19. Stern, Philippe (1934). "Le temple-montagne khmèr, le culte du linga et le Devaraja", Bulletin de l'École française d’Extrême-Orient 34, pp. 611–616. National Review: In Pol Pot Land: Ruins of varying types Sept 29, 2003. UNESCO: International Programme for the Preservation of Angkor Accessed 17 May 2005. Wagner, Jonathan (1992). "Environmental planning for a world heritage site: Case study of Angkor, Cambodia." Journal of Environmental Planning & Management Vol 38(3) pp. 419. Bulletin de l'Ecole française d'Extrême-Orient, 1901-1936. Now online at gallica.bnf.fr, this journal documents cutting-edge early 20th-century French scholarship on Angkor and other topics related to Asian civilizations. Royal Angkor Foundation - Foundation concerned with the safeguarding and the development of the cultural site of Angkor. In charge of various cultural projects. Images from Angkor - Images from Angkor.